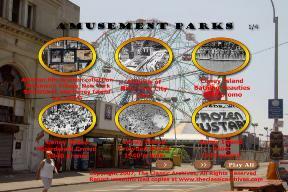 Classic Coney Island Amusement Park Films. See the sights and sounds and smells of the historic park in all its former glory. 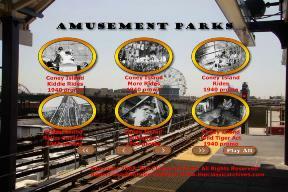 This rare and unique collection of old Coney Island and other Amusement Park films is sure to get your nostalgia juices flowing. Many of these are short promo films, but some others longer in length. If you were ever at one of these historic parks in your life, perhaps as part of your childhood, these films will bring it all back. A collection like no other, this will amuse, entertain, educate, and touch the lives of people who were there. Great for educators, scholars, students, and historians, this makes a great gift for anyone who has any ties to this particular piece of American history. Shows transportation corridors leading into and out of New York City, and efforts at transportation and infrastructure planning. The narrator's voice is very festive. Very helpful to someone who needs to know how to get around in New York City. Everything is shown from parkways, highways, subways etc. they show the transportation of NYC like a beating heart. The babes of the day! The beach, the sun, the ocean, the crowds. A summer tradition in old NY. Nothing beat the food at Coney Island. Nothing. Short clip of rides for the little ones. Views of several rides at the park. This is where the modern day roller coaster was born. Next to the hotdogs, this was always something to check out at the park. Some entertainment for the crowds. Probably the most popular ride at the park after the Cyclone. Short clip of some night scenes at the park. The great American landmark park in its heyday. This is an excellent film that captures the mood of Coney Island when it still at its height in 1940. Luna Park, burnt down in 1944, and the Steeple Chase, thrown down in 1964, are shown. It was at a time when New York City was one of the best places to live in. If you've never had one, you've lived a deprived life. An impressionistic view of a day in the life of Coney Island from the desertion in the early morning to the hysteria at midnight. Commentary by Henry Morgan. Compilation of images and sequences from the Ford Film Collection, with excellent footage of United States history, culture, industry and daily life between about 1915 and 1930. 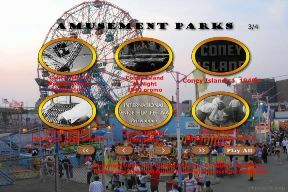 Highlights include Coney Island, the increasing pervasiveness of the automobile in American life, and early manufacturing footage. Old educational film of how a suspension system smoothes out a rough ride. 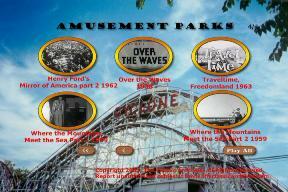 A visit to Freedomland, that other amusement park in New York. Introduces the city of Santa Monica, showing its amenities and the lives of its residents. A great snapshot of life in coastal California at the end of the 1950s.